No firelighters, paper or kindling required. Just light the wrapper. Fast lighting. Instant, cosy fire for up to 90 mins. Can be used in smoke free zones. 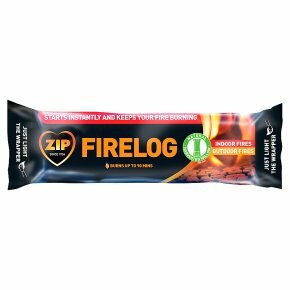 100% natural.The Firelog, new from Zip, is convenient to use, mess and hassle free. This clean burning, 100% natural firelog, burns for up to 90 minutes with no need for additional firelighters, paper or kindling. Simply light the wrapper and after 20 minutes add fuel for a warm and cosy fire. Usage Instructions Do not remove from wrapper. Place the firelog in your fireplace, stove, chiminea or firepit with the horizontal seam at the top. Grasp the wrapper at either end and pull outwards then carefully pull the middle seam upwards. Light at the arrows at either end. WARNING: For use in fireplaces, chimineas, firepits or appliances suitable for coal or wood fires. Do NOT use on a hot grate. In a emergency extinguish with a very wet rag or sand. Do NOT use on a Barbecue.